This is an examination of the ear canal. 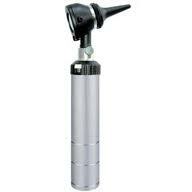 An Otoscope or auriscope is a medical device which is used to look into the ears. Health care providers use otoscopes to screen for illness during regular check-ups and also to investigate when a symptom involves the ears. With an otoscope, it is possible to see the outer ear and middle ear. Real Ear Measurement is a term used for all measurements done directly on the client's ear. These measurements can be done with or without the hearing instrument being worn. The reason Real Ear Measurement is done for hearing instrument fittings is because shape and size of an ear canal significantly influence a hearing instrument's performance. As the shape of the ear is unique to each individual (like a fingerprint), without Real Ear Measurement, only average data can be used. Without proper measurement, this can lead to over or under amplification of the hearing instrument. For adults who can effectively describe if they perceive the sounds as too loud or too soft may not have such a problem. However, when it comes to babies, small children or some mentally handicapped who do not have the ability to describe their perception verbally, it can lead to the problems mentioned above. Sounds are presented using a loudspeaker in front of the test person. A microphone is located close to the ear to measure the sound's intensity. A second microphone measures the sound's intensity directly inside the ear canal in front of the ear drum. Knowing the intensity of the sound inside and outside of the ear enables the filter to determine the actual amplification and output the testee receives through the hearing aid and make the appropriate adjustments. It compares perception of sounds transmitted by air conduction to those transmitted by bone conduction through the mastoid. Thus, one can quickly screen for the presence of conductive hearing loss.A Rinne test should always be accompanied by a Weber test to also detect sensorineural hearing loss and thus confirm the nature of hearing loss. Sound field testing is simply testing while listening to loudspeakers in the sound booth, as opposed to listening through headphones/earphones or bone-conduction oscillators. Sound field testing is usually reserved for testing how well you hear with your hearing aids on, since you can’t very well wear headphones and hearing aids at the same time or you risk getting feedback. Besides, it would be very uncomfortable. During sound field testing, you sit in the soundproof booth facing the front and listen to sounds from two loudspeakers—one on each side of the booth set at 45 degrees to your ears. The main purpose of sound field testing is to compare how well you hear with your hearing aids on as compared to how well you hear with your “bare ears.” Obviously, the results should be much better with your hearing aids on, or you are not getting any benefit from wearing them. Pure-tone audiometry is done in a soundproof booth to ensure that background noise does not affect the test results. As a result, you will only hear those sounds that your audiologist introduces into the room, either though earphones (air conduction response), bone conduction oscillator (bone conduction response) or though speakers located in the room (sound field response). The purpose of the pure-tone air-conduction hearing test is to document the softest tones you can hear at least 50% of the time at selected test frequencies. During this test, you wear headphones and listen for these tones—first in one ear, then in the other ear. Each time you hear a tone, you typically press a button to indicate this. Your audiologist will use a specially-calibrated device called an audiometer (ah-dee-AHM-it-ter) to measure your hearing loss. The audiometer produces a series of tones ranging from very low to very high pitches (frequency). At each pitch (frequency) of sound, you will hear a series of tones (beeps) of varying intensities (loudness). Your audiologist will lower the volume of this tone until you no longer respond consistently. Then she will do the same with a different frequency. She does this for the standard test frequencies between 250 Hz and 8,000 Hz. because these are the frequencies you use for speech. The frequency or pitch of the sound is referred to in Hertz (Hz). The intensity or loudness of the sound is measured in decibels (dB). The softest level at which you can hear each tone is called your pure-tone threshold. Your audiologist will record your responses on a chart called an audiogram that graphically portrays your hearing loss, i.e. the softest sounds you can hear at each frequency tested. For individuals who are deaf or hard of hearing, we carry amplified corded and cordless phones and answering machines, assistive technology, wireless doorbells, hearing aid batteries and accessories, personal amplifiers, and tinnitus treatment products.Order our talking products, low-vision aids, and products for the deaf or hard of hearing easily through our online store and our quality products will be conveniently delivered right to your door.